Have you ever pondered for a moment – if you took your favorite machine from yesterday, and threw all the technology of today at it, what could you create today? What kind of performance numbers could you squeeze out of it? Have you ever asked yourself that question? Brad Mummert of Pennsylvania did, and what he created is nothing short of a modern day work of racing art. Brad combined his love of the Suzuki, model GS1100E series motorcycle of vintage 1980, his favorite motorcycle, and threw everything he could at it from the high performance world. The results are a stunning combination of modern era performance wrapped in a yester-year visual. How’s this; a 7.08 elapsed time performance at 205.61 miles-per-hour squeezed out of an eleven second street bike that hit the streets when Ronald Regan first entered the White House? Yes indeed, the 1981 Suzuki GS1100EX when it came out that year was a 572 pound, roughly 100hp street bike that ran in the eleven second zone with average Andy on board. 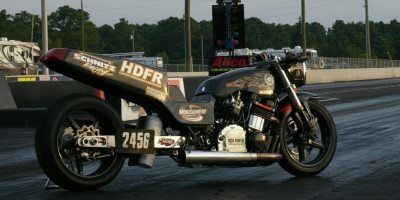 Byron Hines of Vance & Hines Racing owned one. He gave his personal GS1100 a bit of TLC back in 1981 and put his street bike into the 9’s. At the NMRA Spring Nationals in 1981, Byron tuned partner Terry Vance to the number one qualifying spot in Pro Stock Motorcycle with an 8.964 @ 150.75mph. Yes it’s easy to see why the Suzuki GS1100E developed such a strong following so quickly back in 1981. One of them was a 25 year old budding motorcycle performance enthusiast named Brad Mummert. 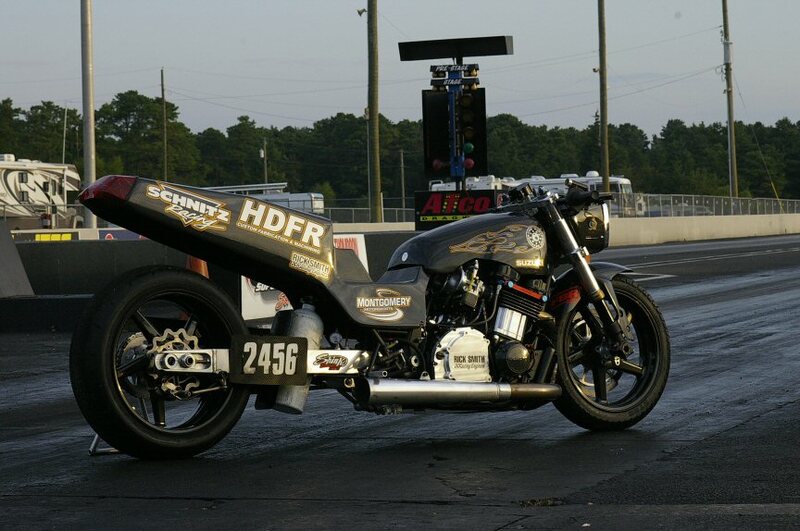 Bad Baby P/St drag bike built by Brad Mummert of PA is truly one Bad Baby! Photo © Tom McCarthy 2013, all rights reserved. “I used to go to Atco to watch the bikes drag race around 1974” he recalls, “I entered my first all bike event around 1978 doing some bracket racing.” Just a few years later in 1980, Brad bought a new Suzuki GS1100EX and his life long love affair with the bike began. Along the way Brad gave his bike all the usual performance upgrades; air shifter, extended swing arm, electronics, etcetera and he marched his bike into the nines, then the eight second zone, just like so many others, but his life and love of the bike took a dramatic turn with the emergence of Pro Street class racing in the late 1980’s. Brad was fortunate enough to get into the Pro Street class on the ground floor, rubbing elbows with the best of the best: Big Phil Gonesh, Joe Franco, Kenny Williams, Brad was there back in day, when Pro Street formed it’s roots. Today the tree has grown and with it, so has Brad’s passion for the class and the sport. He could race a bike in any class, but there’s no place he’d rather be. Just look at what he’s created and you can feel this man’s passion for his class. Today in the year 2013, Brad’s latest incantation of a Pro Street bike is the ultimate blend of yesterday and today. A perfect concoction of performance and presentation true to the Pro Street roots the class sprang from. A veritable who’s – who contributed to Brad’s Bad Baby, he’s current P/St bike. Construction started with a 1980, GS1100 EX, frame that was raked and altered to current MIROCK P/St rule book specifications by HDFR, of Maryland. The custom swing arm HDFR created with the combination set the wheel base at 70 inches. The fabrication work by HDFR as evidenced in the photos is absolutely top shelf. So is every component on this masterpiece of a motorcycle. While the stock factory version of this motorcycle rolls down the road at almost 600 pounds, this street/strip machine tips the scales at 405 pounds. And yes it’s self starting with full working electronics. Much of the weight reduction is due not only to the artful metal fabrication, but from the masterful carbon fiber creations crafted by Montgomery Motorsports in Ohio. 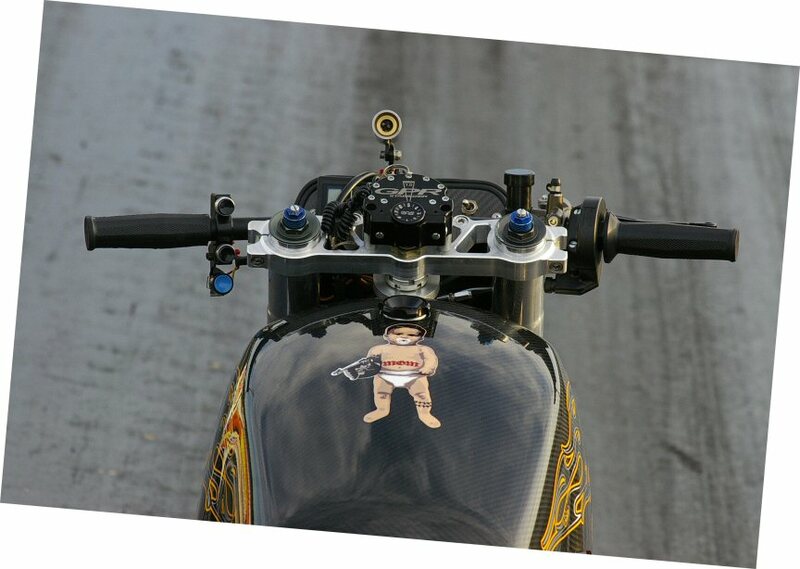 Every body component on Brad Mummert’s bike is a hand laid, carbon fiber weave lamination done by the artisans at Tracy Slemker’s Montgomery Motorsports. Tracy’s staff made moulds from OEM Suzuki parts, and replicated the body components at a fraction of the factory weight. Moulds were made from factory components or custom items taken off Brad’s bike, then each mould had to be hand sanded and finished to receive the layers of carbon fiber held together by liquid resin. Every component then had to be vacuum bagged and sent into an autoclave to heat the mixture to proper temperature while driving out all air pockets and moisture. NASA would love this bike. While the GS1100E is an antique, to say Mummert’s Bad Baby is state-of-the-art is no understatement. A Digital Firestorm ignition/progressive nitrous controller handles engine management duties. Despite the 1640cc Ricky Smith motor sitting in the frame rails, a five pound bottle of NOS weighs in about 1.8 pounds less after a pass down the quarter mile. It’s estimated the bike is producing close to 450hp when the nitrous oxide kicks in. There’s no doubt in anyone’s mind that this machine is headed for a six second zone, 200mph pass, some time during the 2014 season. Such speeds and elapsed times are becoming the norm in Pro Street. That someone has taken the time, the money and the effort to create such a work of art from and old war horse is inspirational to many: the bike has a cult following that has gone world wide. And why not? It’s one Bad Baby, no one can deny that. The photos tell this story best, enjoy! All photographs are © Tom McCarthy, 2013, All Rights Reserved. Drag strip bad, this bad baby is built for speed. Photo © Tom McCarthy 2013, all rights reserved. The Author of this story and Photos would like to thank: Scott Pitas, Jason Miller, MIROCK Racing, Atco Raceway, and Brad Mummert, for their cooperation in making this story and photos come to life. Is the bike pictured for sale ? got a 82 gs 1100 pro street see ya in the lanes and u see my tailight!